I called out to my husband before laying my tired bones to bed last night. “Yes…my Queen,” he says as he comes over to me. “Tomorrow we are going to do better,” I say. He understands in an instant. We both sigh. We’ve just spent a couple of days eating more than usual …it’s not even Thanksgiving yet. Yes….tomorrow! The last of that cake has got to go and we are back on track with eating less. That’s the plan! “We are not going to buy any more sweets, at least until Christmas, “ I say. “Right-O,” says hubby. “But what about the ice-cream; we still have chocolate-chip cookie dough left,” he adds. Hmm….yes the ice-cream. “OK…after the cake and after the ice-cream,” ….my voice trails off. Then I think of something I had told my sis just the night before. Sis and family, on their way to Louisiana for a wedding, stayed with us for a brief overnight visit. We really had such a lovely time together –as we always do–not to mention it was wonderful to spend time with my awesome-to-the-max nephew, Alexandre-the-Greatest…and his papa too…..
“If you lived here (in Alabama) it could very well change my whole view of this place I call “middle earth.” I could even start to like it here. I might even stay in middle earth.” Oh good God..did I just say that?! You see, when we get together we do some of my favorite activities (besides physical activities, that is). We cook….we eat….we enjoy wine…we shop….we just plain hang out. Unfortunately, It’s the cooking and eating part of the fun that is hard on me particularly since I cannot pound the pavement to get rid of excess calories like I could do just a couple of years ago. This Italian girl used to eat hefty bowls of pasta two to three times a week; now it’s twice a month, maybe. I used to enjoy big chunks of toasted La Brea bread with cheese or dipped in extra virgin olive oil on a daily basis. That’s almost a distant memory now. Well…the bread that is; I’m still holding on to my cheese; you’d have to kill me to take that away! Anyhow, now I must watch every single morsel that goes into my mouth. I’ve tried to give up entire food groups but tell me…where is the fun in that? One of my old bosses (that would be the chiropractor) recently messaged me through Facebook trying to rope me into his side (can-you-say-pyramid scheme) business venture….selling Isagenix weight-loss products. Yes, I looked at the docs pictures on Facebook and was mighty impressed–and somewhat shocked too– because I felt he looked borderline emaciated. The doc and his wife drastically changed their diets and transformed their bodies with the products. They were thin to begin with, in my humble opinion! I’d no doubt look like a Sports Illustrated swimsuit model too if I cut out entire food groups and drank shakes (which I hear are disgusting) for lunch and dinner every day. Frankly, I am mighty tired of giving up stuff! Life is just too damn short not to enjoy some of these few pleasures…(good red wine, chocolate, pasta and cheese just to name a few). Besides, I’ve re-thunk my whole position on living to a ripe old age. I don’t have any desire to be a centenarian. Well…OK…If I had money, perhaps. If I were independently wealthy I could still live in my nice house and afford to have a host of people looking after me. I don’t want to be a burden on anyone and while it would be nice to be able to count on my children being around for me in my advanced years I’m pretty sure they’d rather roll my wheelchair into the lobby of the nearest nursing home, park it, and visit me once a year (if I’m lucky). I’ll be happy with living to be …say….88… and I’m cautiously optimistic that I’ll still be relatively physically strong and self-sufficient. Indeed, hopefully God will smile on me and through His mercy He’ll give me the big one (as in massive heart attack or stroke) so that I can meet Him at the pearly gates in an instant and not after a prolonged, painful and expensive illness. The bottom line? I just have to find that happy middle ground. Moderation. I’m going to enjoy ice-cream and cheese….yes indeed. I am not going to stress out about eating pasta two days in a row like I just did. That’s not something I do often anyway. So pasta two days in a row….how did that happen? In the days leading up to my sister’s brief visit I fretted over what to make for our get-together dinner. My sis is really an awesome cook and my bro-in-law is equally at home in the kitchen. I looked through a few of my favorite cookbooks. I thought of preparing something from Marcella Hazan in memory of her recent passing…. I thought of my super easy standby…Hard Times Chili. Nope….I made that for them during their last visit. I thank my sis for telling me about this cookbook! 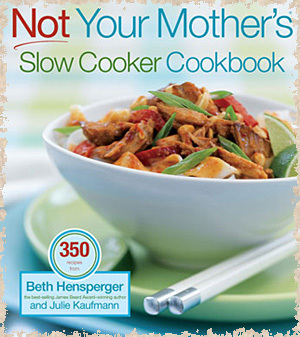 Then I looked through my Not Your Mother’s Slow Cooker cookbook and settled on something new to try. Veal stew. Surprisingly, I found the veal stew meat at Fresh Market. The morning of their arrival I ran around the house vacuuming and cleaning in preparation of their visit. At noon I hauled the crock pot out for the first time this year. It was an easy recipe to put together; after dredging the veal pieces in flour and browning them in olive oil it was just a matter of throwing all the remaining ingredients (a surprisingly short list of them) plus the veal into the crock pot. While I was preparing the crock pot dish I still couldn’t get my mind off of Marcella Hazan. My friend Lou had told me of Marcella’s passing at the age of 89 just the day before. Marcella has been one of my favorite Italian cooking masters for years; she has been instrumental in helping me stay close to my Italian roots in the kitchen. So, I decided on one of my favorites from her book Marcella’s Italian Kitchen and made Red Peppers stuffed with zucchini and fontina cheese. I’ve made that dish many times and never fail to get oohs and aahs over it. Salute…e mille grazie, Senora Hazan. OK…so I’ve got veal stew….stuffed peppers….I just need to think about an appetizer. Whew. The appetizer was easy. I’d tried an artichoke crostini recipe from Rocco DiSpirto’s cookbook the week before. That didn’t even take five minutes to whip up. Sis and bro-in-law raved over it. But…where’s the fun in no dessert? Oh hell. Let’s make something I haven’t tried before. Besides, I rarely bake anymore. Therefore it only made perfect sense to make a carrot cake with orange cream cheese frosting. Yep…all the fat..and twice the sugar. I didn’t hold back. I have to say that our dinner was not only exquisite but it was a team effort. Sis put her special touch to the veal stew before presentation in her a dash more of this and another pinch of that fashion. And bro-in-law got into the act too. The recipe called for buttered noodles or polenta. I was partial to having buttered noodles, particularly because I knew Alexandre-the Greatest would positively devour them. Bro-in-law wanted polenta and even offered to make it; definitely an offer I couldn’t refuse! Still….”why can’t we have both?” I asked. No reason! So we hauled out my large, ridiculously heavy, cobalt blue Le Creuset pot and bro-in-law went to town making the polenta while I prepared the noodles topped with divine Plugrá European-style butter and freshly grated Parmesan cheese. All I can say is that three days later I remain in a blissful food coma and God love her….its my sisters fault! (Just kidding sis if you’re reading this!) My veal stew dish was heavenly and even better the next day, along with another helping of buttered noodles. True comfort food! And, we’ve had carrot cake for days….even inviting neighbors over to help us get rid of it. I simply had to get it out of the refrigerator and truthfully, I’m not sad to see the carrot cake go….extremely yummy but the sugar overload definitely was getting to me. We even passed on purchasing the ingredients for the Williams and Sonoma Pumpkin Squares recipe today while visiting the store. “No Thank-Ewe,” hubby said in his occasional southern drawl. “We need a break from sweets I solemnly informed the sales associate.” His look suggested pity as if to say “It’s not even Halloween yet!” But the veal stew? A keeper. I’m already thinking of when I’ll make it again. All that cooking, eating, and yes…cleaning… was pure bliss. Sure, I can definitely feel the over-eating on my hips… but you know, I don’t get to spend a lot of time with my sis and her family. Life is short. Watching these beautiful souls in my kitchen…observing Alexandre-the-Greatest happily devour a bowl-full of noodles… hearing all the expressions of delight around the dining room table– with Vivaldi (chosen by bro-in-law for the specific occasion) playing in the background–and knowing that my hubby and sis and family were truly enjoying the feast made me feel blissfully happy. Honestly, I wouldn’t trade that for size 6 jeans… ever.